I can’t believe I’m really saying this, but I’m officially done with ALL of my classes in the Entry-Level Master’s Program! I want to take this final blog post to reflect on the past two years in the program, and to share what’s coming up next for me! Warning: this one gets a little sentimental. I’ve taken (and passed!) 22 classes. That’s included countless exams and the 4 P’s (papers, posters, presentations, and projects). Those classes have included so many opportunities for group work, which have encouraged me to see multiple perspectives, enhanced my communication skills, and have given me the chance to get to know so many of my classmates on a deeper level. 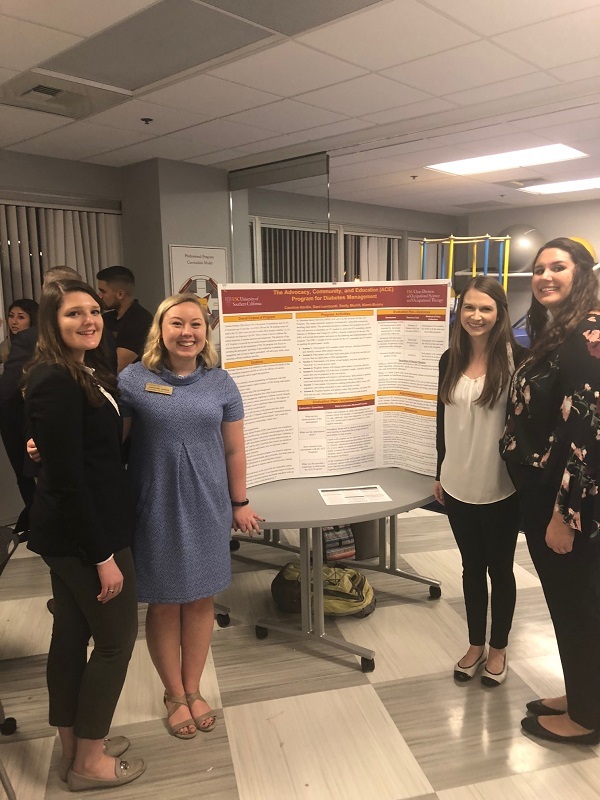 Each class covered a different topic; I’ve learned about specific practice immersion areas, research methods, program development, leadership, therapeutic use of self, and so much more! I used this Spring semester to take elective courses to dive into pediatrics, the practice area I’m most interested in. Altogether the curriculum has prepared me to be a general practitioner, ready to work as an OT in any practice area. I’ve loved how active and hands-on many of the courses were! Here I am with my friend Niamh trying out a tactile sensory experience in the Pediatrics lab. Presenting our diabetes-management program poster for the Occupation-Centered Programs for the Community Course. In those 22 classes, I’ve been instructed by 26 outstanding faculty members, who each brought their own unique experiences and perspectives to the classroom and the course material. Seriously, the USC Chan faculty members are passionate, experienced, and understanding – they’ve truly made this learning experience a positive one. They’ve challenged my clinical reasoning and they’ve supported my development to becoming an entry-level practitioner. Cohort A after finishing our Pediatrics immersion with Dr. Diaz and Dr. Gunter. I’ve learned and studied with 136 classmates. These students have come from so many unique backgrounds and will end up working in a wide range of different practice areas. The passion, drive, and enthusiasm in my class has been so impressive, but it has always felt like such a supportive group! Spent hundreds of hours in class with the awesome Cohort A! I was inducted into Pi Theta Epsilon, the National Honor Society for Occupational Therapy. With my fellow PTE Inductees! I completed 4 fieldwork placements (3 Level I and 1 Level II). Each placement was in a uniquely different practice area: an acute hospital setting, an outpatient forensic mental health setting, a community-based center for older adults, and school-based pediatrics. In each setting, I got to connect with real clients and work through the OT process with them to help them achieve their goals. It was in these environments where I felt the most challenged, but also the most rewarded; getting an A on an exam feels great, but actually helping a client feels WAY better! One more Level II Fieldwork to go this summer! I’ve dedicated 350+ hours of work in this role as a Student Ambassador. I’ve had the honor of representing the Chan Division over the last year and half and sharing my experiences as a student in this program through this blog, but also by conducting tours and information sessions for prospective students on campus, presentations to pre-OT clubs at universities in Southern California, and tabling at health fairs. Serving as a Student Ambassador has been one of the highlights of my experience in the program, because of the opportunities and experiences it has given me, but also because of the people it’s brought me closer to. This position has allowed me to get to know my 5 amazing coworkers: Ali, Bryan, Erika, Kaitlyn, and Linah, none of whom I knew very well before starting in this role! The fabulous Student Ambassador team I’ve had the pleasure of working with. Thanks for making work FUN! I’ve also been so lucky to get to know my supervisors who oversee admissions, recruitment and events for the Division: Kim Kho, Liz Carley, Erin McIntyre, Amber Bennett, and Bianca Ojeda. It’s truly been a pleasure to work with and learn from these women! The Student Ambassador team together with the whole Admissions, Recruitment, and Events team at our end of the semester lunch! 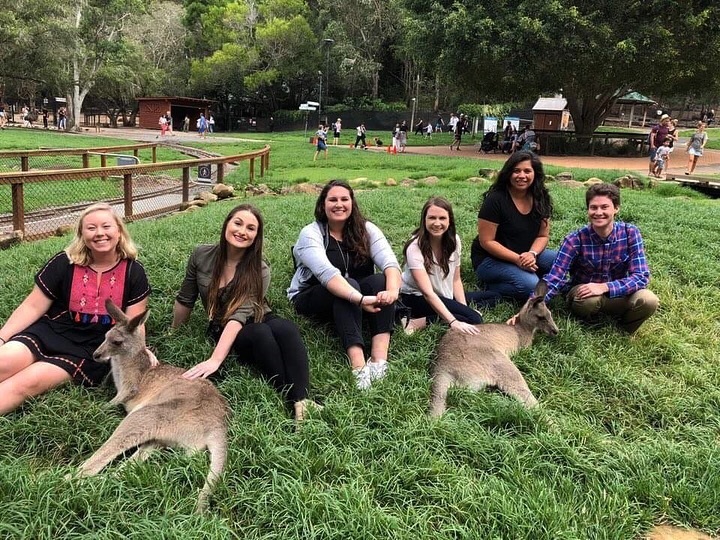 I spent 2 weeks in Australia for my leadership externship, where I learned about occupational therapy education and practice at Griffith University and their affiliate clinical sites. Presenting to Griffith University OT students and faculty about OT education and practice in the US! I’ve supported the Trojans at 11 home football games and tailgates, including 2 homecoming tailgates! Fight On! Prepping for the Homecoming football game at the Homecoming tailgate. I’ve spent countless hours at the OT House not only studying, but also spending time with friends and talking about topics other than OT (No Homework Saturdays!!). Holiday gift exchange at the OT House! There’s definitely been time for a few parties, too! Celebrating the first summer session at the Decades Party, held at the Center for Occupation and Lifestyle Redesign. Love a good themed party! The annual OT Vegas trip in January. Finally, I’ve made 7 incredible, lifelong friends in this program: Emily, Niamh, Dani, Brett, Brooke, Hanna, and Heather. I moved from North Carolina to Los Angeles to start this program. I was 21, had just graduated from college, and I was starting grad school in a new city where I didn’t know anyone – it was a scary transition! That feeling went away much quicker than I’d anticipated. I’m so lucky to have found a place in the group of friends that I did. These two years would not have been the same without the laughs, the support, the debriefs, the study sessions, the outings, and the dance parties. These 7 friends have made the past two years an incredible experience! In my very biased opinion, they are all going to make stellar OTs! In a few days, I’ll be graduating from the Entry-Level Master’s program, but there are 3 additional things I have to do before I can call myself a registered occupational therapist: (1) Take the Comprehensive Exam; (2) Complete my final 12-week Level II Fieldwork experience; and (3) Take and pass the National Board Certification in Occupational Therapy exam. I’m staying at USC to get my Doctoral degree (OTD); the program is 1 year and begins in August. I am pursuing the Advanced Clinical Practice track of the OTD, and I will be completing my residency at the USC University Center of Excellence in Developmental Disabilities (UCEDD) at Children’s Hospital Los Angeles. I’m looking forward to spending the upcoming year developing my clinical expertise in the clinical practice area of pediatric mental health! I’ve wanted to be an Occupational Therapist since the 8th grade, and it’s surreal that I’m so close to accomplishing this dream! 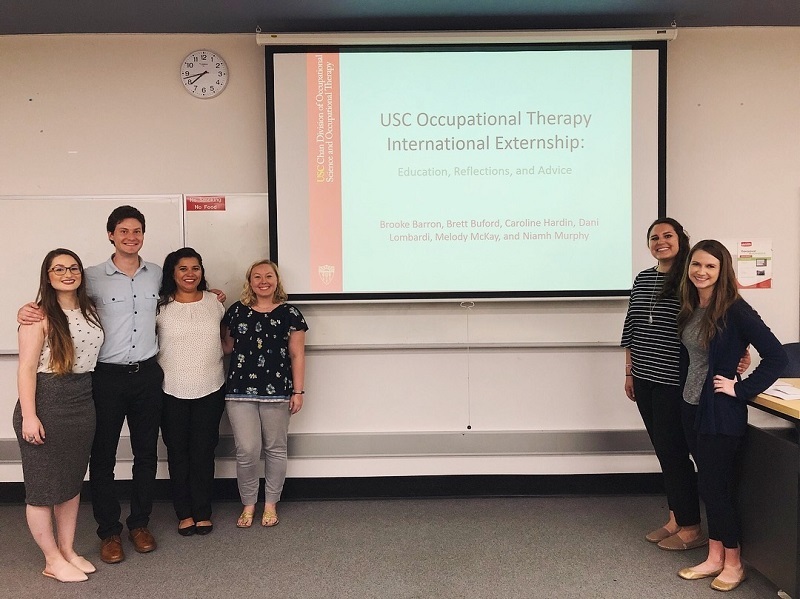 I’m so thankful for the learning experience I’ve had these past two years, and I’m looking forward to one more year at USC to gain advanced skills in OT! Thanks to my family, friends, fellow Student Ambassadors, and classmates for the support these two years. And, finally, thanks to the readers – best of luck as you pursue your OT goals! !